I just love when the fall colors start coming out. Living in the South, we see so many different colors in the trees and mountains and those colors are my favorite part of the season…well, that and football! I wanted to share with you some of my favorite ways of bringing those beautiful fall colors into your home this season and I thought that a gorgeous DIY fall centerpiece would be the perfect way to do that. So, I wanted to show you my favorite 15 DIY fall centerpieces that will dress up your dining room table in style, or any table in your home! None of these are hard to make and many of them use supplies that you can pick up at the Dollar Store or Dollar Tree. That means they’re also really cheap to make and they all have those gorgeous fall colors of oranges, browns, and even some reds and yellows. From candles and lanterns to some gorgeous rustic DIY fall centerpieces, you are definitely going to find a lovely way to bring those fall colors into your home this season. And, if you’re looking to add some fall colors to your outdoors, be sure that you check out these 25 fall porch decorating ideas, too. I just can’t get over how beautiful those fall colors are! I honestly love summer and while part of me hates to see it go every year, part of me just can’t wait until the leaves start turning and everything gets so warm and beautiful. If you love those fall colors, you are going to adore these DIY fall centerpieces. They will help you to add so much beauty to your home. And, you can add even more fall gorgeousness with these 60 fall DIY projects for every room in your home. 12. DIY Light Up Pumpkin Centerpiece – Dollar Store Craft! You can easily make this DIY fall centerpiece with some cheap supplies from the Dollar Store. 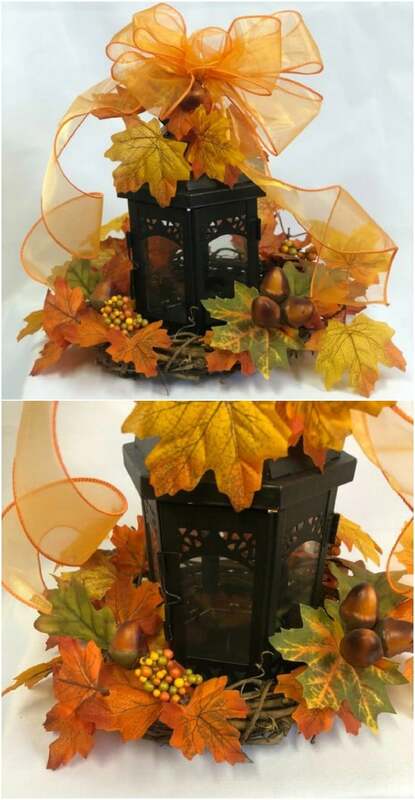 You just need a decorative lantern and a few fall leaves and possibly some wired ribbon. This is a beautiful display and it will only take you a few minutes to put it together. I found this one on Etsy and if you would rather buy than DIY, you can pick this one up for about $34. I love this DIY fall centerpiece that is essentially just some really large acorns – that you can paint with chalkboard paint! I love DIY chalkboard paint projects and this one is just perfect for fall. 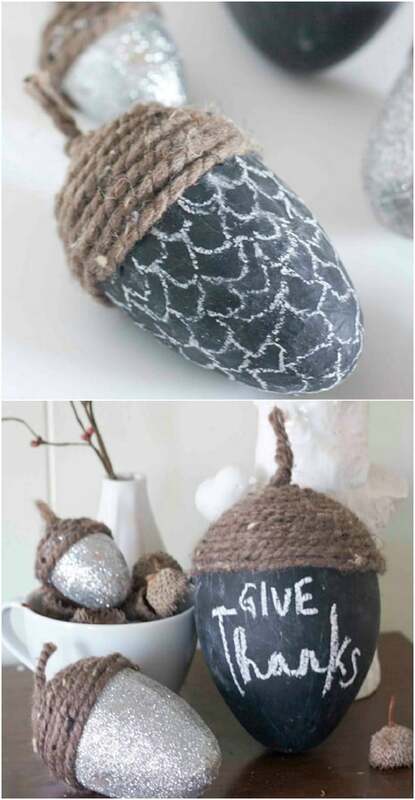 You make the acorns with paper mache eggs that you can either make yourself or buy at Michael’s or Hobby Lobby. Then, you just decorate them and add your chalkboard paint for a special fall message. This DIY fall candle centerpiece is super easy to put together and you can get most of the supplies for it from the Dollar Store, so it’s also super cheap. You just need a wooden tray, some tall glass candles or candleholders and a collection of fall decorations like leaves, berries and stems or whatever else you can find. You can alter this one and change it from week to week, too if you want to mix things up a bit. This DIY fall basket centerpiece is really easy to make and pretty cheap, too. Dipping the basket gives it a great two toned color – although you could leave that step off if you wanted to. This is a great project for using up some of those empty mason jars – or any other glass jars that you have on hand – and you can get beautiful fall flowers from the Dollar Tree for just a dollar for a large bunch. This DIY fall centerpiece is really cheap and easy to make. You just add your candleholders and other decorations to a basket or tray. You can use real fall leaves from outside, just remember to change them out periodically, so they don’t go completely limp. This is such an easy one to put together and it has a really elegant look when it’s finished. 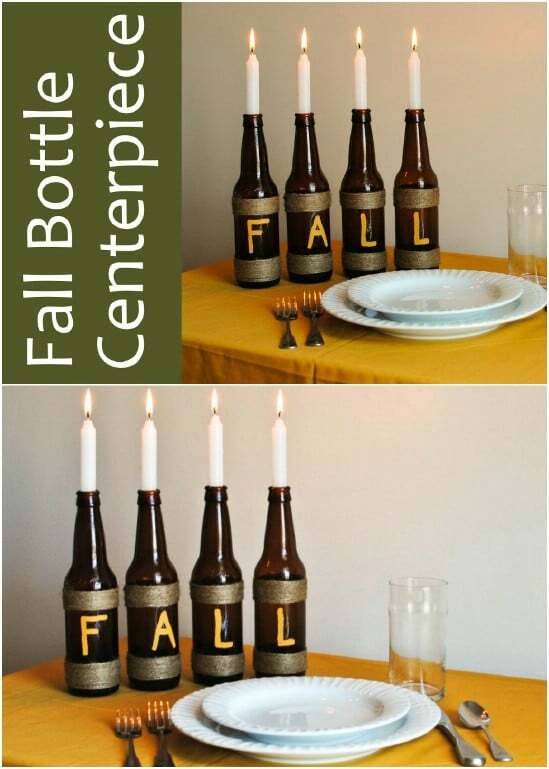 I love the idea of using empty soda bottles – or other glass bottles – as a centerpiece for your fall table. This one is super easy and it’s a gorgeous one when it’s finished. You just need four bottles – and if you don’t have amber colored ones, you can paint the ones that you do have! You also need some acrylic paint to make the wording and some twine for the bottle decorations. This DIY fall centerpiece is super easy and you can get all of your supplies from the Dollar Store or Dollar Tree – or outside! 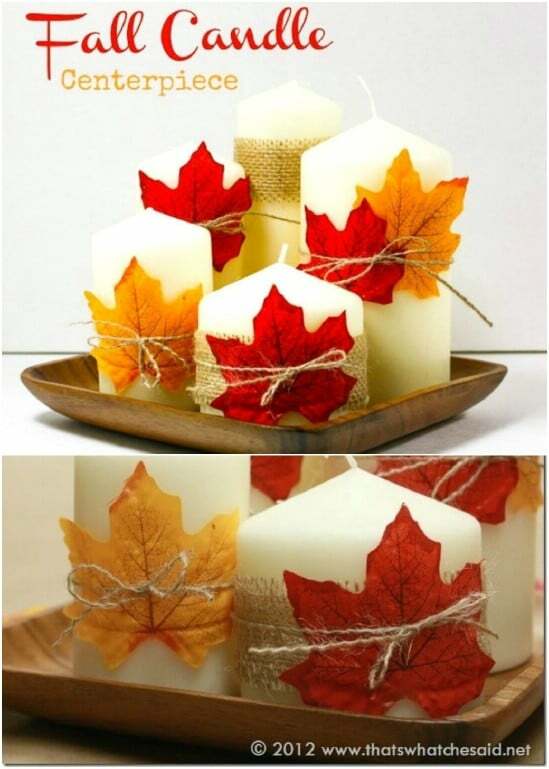 You just need some wide candles, burlap and twine to make these – along with some faux fall colored leaves or real leaves if you prefer to use them. Each candle has its own fall leaf decoration and when you put them all together, they make a stunning centerpiece that is filled with the beautiful colors of autumn. I love projects that let you repurpose old mason jars. This one in particular is really easy and gorgeous when it’s finished. You just paint some old jars with acrylic paints in the colors of fall. 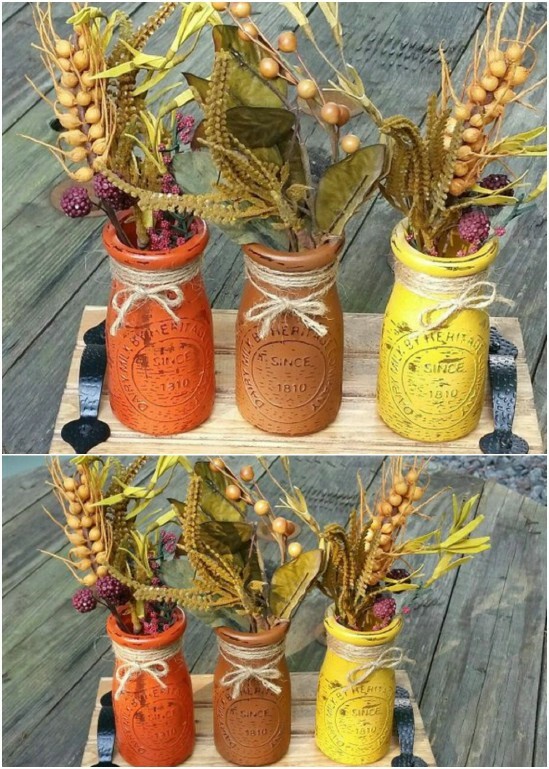 Then, you use those jars as vases to create your gorgeous DIY fall centerpiece. 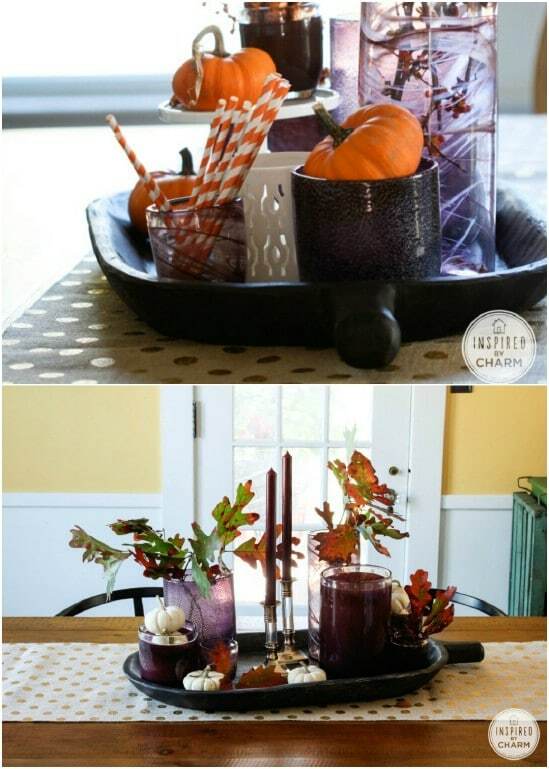 This one is really quick to make and you can use the jars throughout the house to create a fall colored theme. I found these particular jars on Etsy for under $30 for a set of 3. 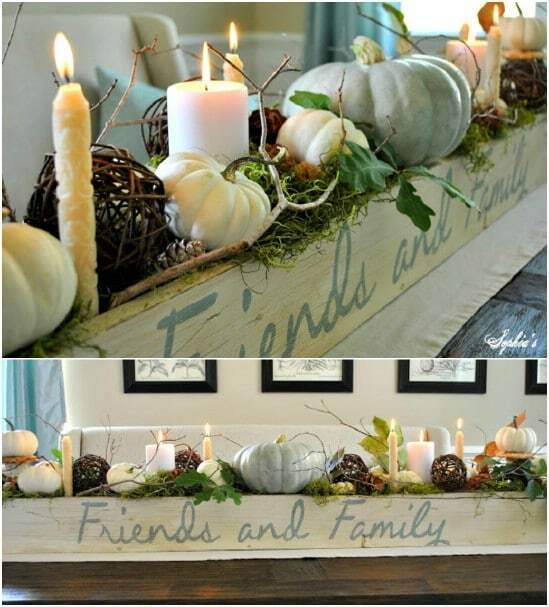 This DIY planter box centerpiece is perfect for fall, and particularly for Thanksgiving. You paint the box in lovely rustic shades and add “Friends and Family” to it. 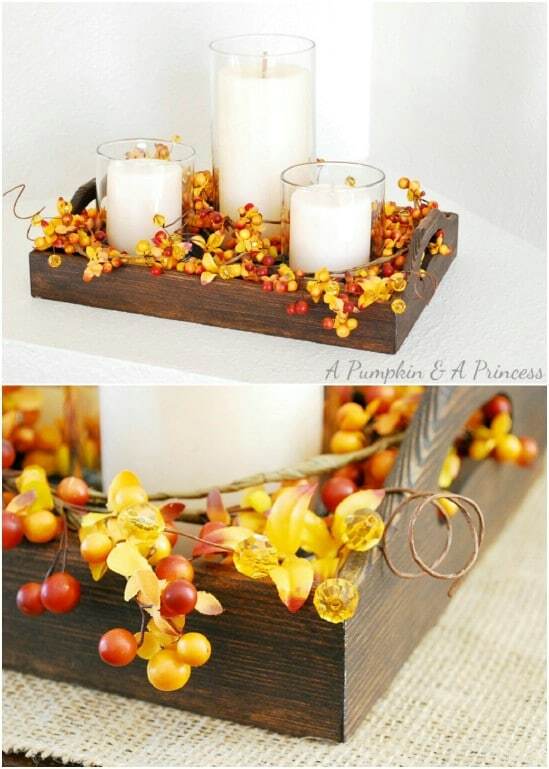 Then, just fill it with a lot of fall decorations like pumpkins, candles, fall leaves and other decorations. 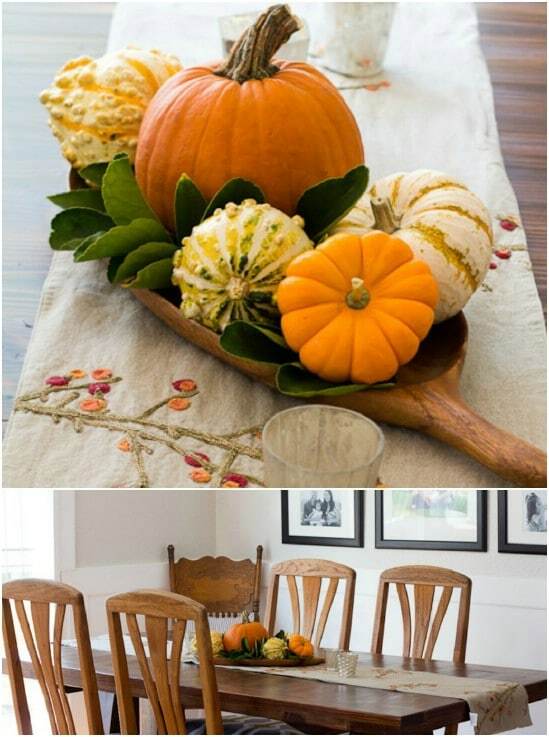 This is a simple one to make and it will look gorgeous on your fall dining room table! And, if you can’t find a planter box or don’t want to buy one, they’re easy to make yourself! You can use a DIY window box planter for this one. Gilded apples are great for creating a fall themed centerpiece and they are really easy to make yourself. 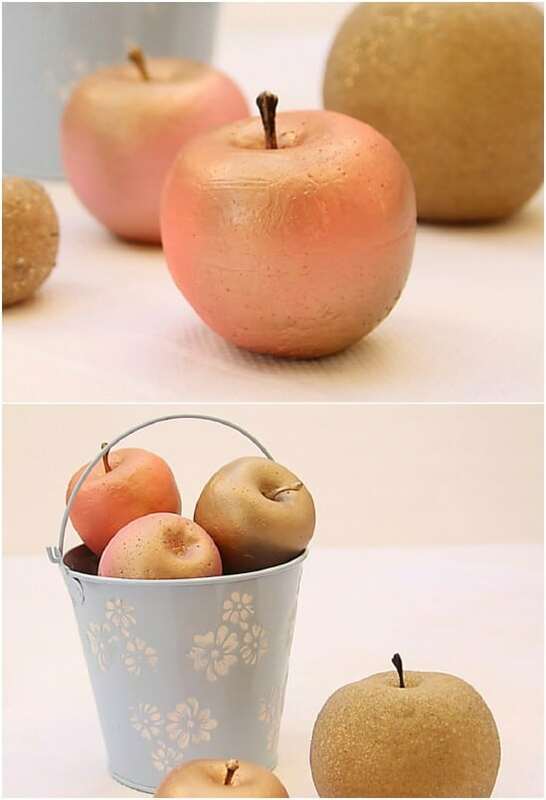 You make these with Styrofoam apples, which you can get at any hobby and craft store. You also need acrylic paints in the colors of fall apples and metallic gold spray paint to give them that great gilded look. Once your apples are done, you can add them to a small galvanized bucket, a wooden tray or any number of other things to create your centerpiece. These little white pumpkins are adorable on their wooden bases. This DIY fall centerpiece would be so simple to make and if you have a couple of small logs that you can cut up and the white pumpkins, it won’t cost you anything to make. You could also use orange pumpkins for this or mix and match them, maybe even add in some colored gourds to make it full of fall colors. This DIY light up pumpkin will make a beautiful centerpiece for your fall table, and you can make it completely from Dollar Store supplies. You can even get the fall leaf decorations for this one at the Dollar Store. All together, it will cost very little to DIY this one and it’s gorgeous once it’s completed. 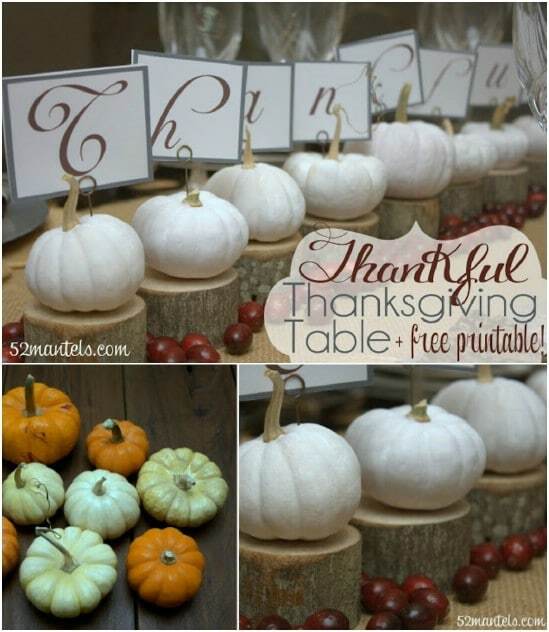 This would be perfect for your table from September through Thanksgiving! This quick and easy centerpiece costs very little to make and it is absolutely perfect for fall. 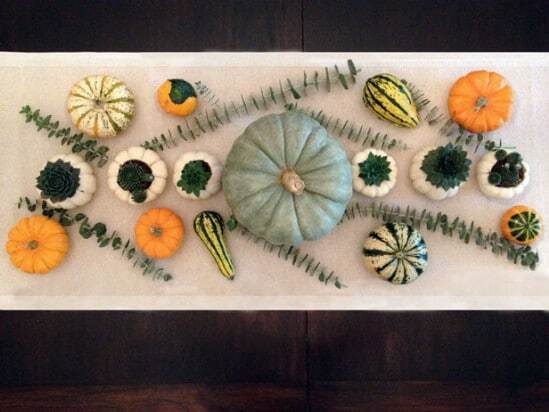 You just need a small collection of tiny pumpkins and gourds and then something to use as the base. This one uses an old wooden platter but you could also use a narrow bowl or even a serving platter or tray if that’s what you have on hand. I found these adorable little wood slice pumpkins on Etsy. You can get one for around $9 or a complete set of three for under $30. They are made with repurposed wine corks but you could also make these from wood slices. You just paint them orange and then assemble your pumpkin, adding in a natural wood slice for the stem. How adorable are these? You just set them on your table and they instantly become the perfect DIY fall centerpiece. The perfect centerpiece for fall is something that has a few fall colors and ideally, includes a pumpkin, right? These DIY pumpkin succulent planters are great. You make your own planter out of a live pumpkin and you can add in succulents that have deep greens and even browns and reds so that you have the perfect collection of fall colors. These are super simple to make and are perfect for decorating all over the house!